The ivy-clad Chase Hotel is surrounded by nature’s finery; scenery of such astonishing beauty that you may be forgiven for thinking you’ve inadvertently wandered onto the film set of The Lord of the Rings. Indeed, the nearby Forest of Dean is said to have inspired JRR Tolkein. Staying at the Chase Hotel, you’re just a 2-minute walk from the historic centre of Ross-on-Wye, the birthplace of modern tourism. Perched in 11 acres of peaceful parkland, this Georgian country house hotel treats you to views of the Malvern Hills and award-winning fine dining. In the summer, sail above the spectacular Wye Valley in a hot air balloon launched from the hotel grounds. Enjoy a slice of country life with country pursuits aplenty. Dining really is some of the best in the area. Whether you’re sitting down to eat in AA Rosette-awarded Harry’s Restaurant, or on the shaded summer terrace, with gorgeous views of the gardens and ancient Chase Wood. The Wye Valley Walk starts by Ross-on-Wye’s red sandstone market hall and ends on an exhilarating ascent to the top of the Wood. The village of Symonds Yat is 7 miles away. 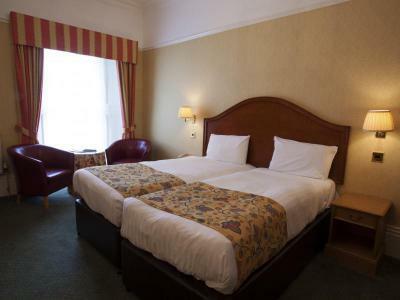 Each of the 36 rooms at the Chase Hotel benefit from free Wi-Fi and Sky channels (Sky Sports 1, Sky Sports 2 and Sky 1). Picturesque countryside views are enjoyed by Superior rooms. Marble-tiled en suite bathrooms feature in Executive rooms. All rooms are located on the first floor, up a single flight of stairs. Room service is available. Wake up inspired. Wake up with Classic British Hotels. We say: These rooms look onto an internal area of the hotel. They're great value for a night away: Country style en suite bedroom, 172 sqf, offering free Wi-Fi, satellite TV with digital channels, digital radio, DVD player, writing desk, direct dial telephone, alarm clock, ironing station, trouser press, tea and coffee making facilities, and hairdryer. Double bed. Accessible? These rooms are located on the first floor and have a bath with shower. We say: These rooms look out over the gardens and parkland. They’re bigger than the classic doubles: Country style en suite bedroom, 215 sqf, offering free Wi-Fi, satellite TV with digital channels, digital radio, DVD player, writing desk, direct dial telephone, alarm clock, ironing station, trouser press, tea and coffee making facilities and hairdryer. Double bed. Accessible? These rooms are located on the first floor and have a bath with shower. We say: These rooms look out over the gardens and parkland. They're bigger than the classic doubles: Country style en suite bedroom, 215 sqf, offering free Wi-Fi, satellite TV with digital channels, digital radio, DVD player, writing desk, direct dial telephone, alarm clock, ironing station, trouser press, tea and coffee making facilities and hairdryer. Two single beds. Accessible? These rooms are located on the first floor and have a bath with shower. 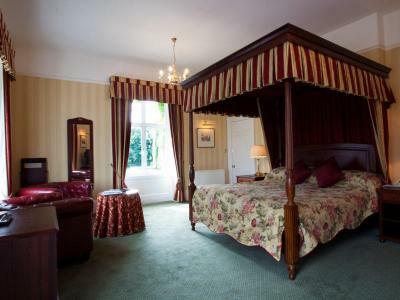 We say: These rooms look out over the gardens and parkland. They're bigger than the superior doubles and have larger TVs. Jacuzzi baths feature in the marble en suite bathrooms. Perfect for a romantic weekend away: Country style en suite bedroom, 269 sqf, offering free Wi-Fi, satellite TV digital channels, digital radio, DVD player, writing desk, direct dial telephone, alarm clock, ironing station, trouser press, tea and coffee making facilities and hairdryer. Double bed. Accessible? These rooms are located on the first floor and have a Jacuzzi bath with shower. 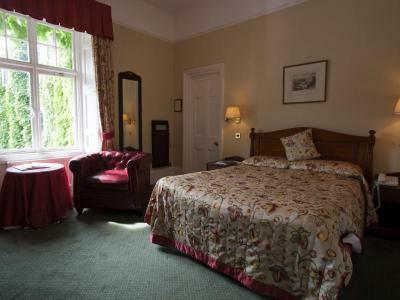 We say: These rooms look out over the gardens and parkland. They're bigger than the superior doubles and have larger TVs. Jacuzzi baths feature in the marble en suite bathrooms. 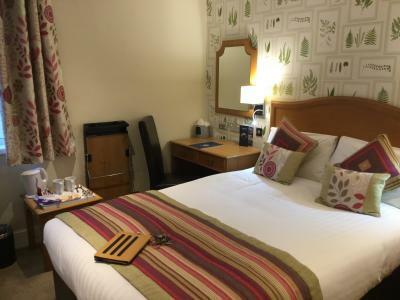 Perfect for a romantic weekend away: Country style en suite bedroom, 269 sqf, offering free Wi-Fi, TV with digital channels, digital radio, DVD player, writing desk, direct dial telephone, alarm clock, ironing station, trouser press, tea and coffee making facilities and hairdryer. Double bed. Accessible? These rooms are located on the first floor and have a Jacuzzi bath with shower. We say: These rooms look out over the gardens and parkland. They're the biggest rooms in the house. Jacuzzi or freestanding baths feature in the marble en suite bathrooms: Country style en suite bedroom, 538 sqf, offering free Wi-Fi, satellite TV with digital channels, digital radio, DVD player, writing desk, direct dial telephone, alarm clock, ironing station, trouser press, tea and coffee making facilities and hairdryer. King-sized bed. Accessible? These rooms are located on the first floor and have a Jacuzzi or freestanding bath with shower. One room has a double-ended bath and a walk-in shower. Take the M50 to the end (junction 4) then join the A449. Continue on the A449 until the 1st roundabout. Turn left onto the A40 relief road, signposted to Ross-on-Wye. At the 2nd roundabout, turn right onto the A40 Gloucester Road towards Ross-on-Wye town centre. The Chase Hotel is half a mile further along on the left-hand side. Approaching from the M4, travel westwards to junction 15. Take the A419 towards Cirencester. Pick up the A417 towards Gloucester. At Gloucester, take the A40 towards Ross-on-Wye. Follow the signs to Ross-on-Wye town centre and turn left at the next roundabout. The Chase Hotel is half a mile further along on the left-hand side. Harry's Restaurant is named after the owner's grandson and treats guests to a European-orientated menu in stylish surrounds - shades of cream, tan and black, plush leather seats and pale silk drapes fuse with original high ceilings and ornate plasterwork. Head chef Richard Birchall has built up quite a reputation over the years for his delicious food prepared from fresh, local produce. The à la carte menu offers comfort (think fish and chips), plus plenty of ambitious options, with an emphasis on meat. Desserts include Brookes Herefordshire ice creams and Hereford hop - full fat hard cow's cheese encrusted in hops. A good selection of wines feature, 8 to 10 available by the glass. The Chase Bar serves a wide range of wines, draught beers, liqueurs and spirits, including traditional cask ales and local cider from Wye Valley Brewery and Westons Cider. In the winter, after a rewarding day spent exploring the Forest of Dean, you can sink into a sofa and enjoy a pre-dinner tipple by the enticing open fire. A comprehensive bar menu offers an informal alternative to Harry's Restaurant. In the summer, dining at the Chase Hotel reveals an altogether different flavour. Take a seat in the fresh open air – sunny or shade – and dine al fresco. The Chase Bar leads out onto the broad stone terrace, enjoying scenic views of the gardens and surrounding Chase Woods. After exploring the local area on foot, find your perfect spot in the gardens to wile away an hour or two. Don’t miss the opportunity to indulge in afternoon tea whilst staying in this glorious setting – savour homemade scones with fruit preserve and cream, sandwiches, cakes and a pot of tea. Both traditional afternoon tea and champagne afternoon tea are available to order and can be enjoyed in the lounge - sitting comfortably by the roaring open fire - or on the summer terrace. Afternoon tea can be booked in advance, at a special price, when booking your room via ClassicBritishHotels.com. The unique surroundings of the Chase Hotel present a wonderful setting for private dinners and celebrations. The hotel caters for reunions, anniversaries, family gatherings, birthday parties, charity and club events, and business dinners. Choose from a range of private rooms, each with its own individual character. Call Classic British Hotels on 0844 967 0984 for advice and let us help you organise a memorable private dinner. Goodrich Castle is one of the finest and best preserved of all English medieval castles. Hear all about the desperate Civil War Siege, grimace at the murder holes built into the castle walls, and admire the stunning stained glass window in the 13th-century chapel. From its Norman origins, to its dramatic fall in 1646, this splendid example of English military architecture once controlled a key location between Monmouth and Ross-on-Wye. William Wordsworth praised it as the "noblest ruin in Herefordshire." A cathedral has stood on this site since Saxon times. Indeed, martyred Anglo-Saxon King Ethelbert, to whom Hereford Cathedral is dedicated, was the first English king to convert to Christianity on the arrival of St Augustine's mission to Kent. Today, the building stands as testament to architectural excellence from Norman times up to the present day. Its Romanesque nave, the north transept containing the Shrine of St Thomas of Hereford, and the award-winning New Library Building are fine examples of this. Not your everyday adventure playground. There's something for everyone in this unforgettable part of the world - from mountain biking and kayaking, to the magical Puzzlewood and Clearwell Caves, to sculpture trails and steam trains. The Royal Forest of Dean is one of the only surviving ancient woodlands in the UK and has played host to countless films, including, most recently, Star Wars: Episode VII - The Force Awakens. May the forest be with you. Download your 'Film & TV Tourism Trails' leaflet (pdf). Symonds Yat is a village in the Royal Forest of Dean. It straddles the River Wye and is a popular tourist destination owing to its stunning river scenery and ancient wooded expanses. Symonds Yat Rock rises 500 feet from the banks of the River Wye and is an internationally renowned viewpoint - the river winds its way around the limestone outcrop through a deeply wooded gorge. It is the site of an Iron Age hill fort and the film location used for Harry Potter and the Deathly Hallows Part 1. Download your '12 Easy Walks' leaflet (pdf). 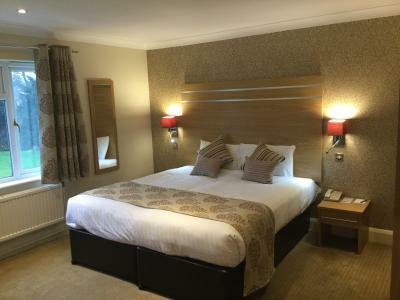 The Chase Hotel offers all the benefits of a tranquil, period, country house hotel with the facilities and services you would expect from a professional, business-focussed property. The hotel is ideal for all types of events, from large conferences, to executive meetings. The Garden room has inspirational views over the hotel grounds with a glass doorway giving breakout into the gardens. It offers the perfect solution for any company seeking a training room with direct access to extensive grounds, within which a variety of outdoor pursuits and team-building activities can be arranged. There is free Wi-Fi and free on-site parking. The Oak Suite, next to the Garden room, has one side completely glazed, affording views and direct access onto the garden terrace and grounds beyond. It can be separated into two smaller meeting spaces. The Boardroom features a central cherry wood table and Italian leather 8-hour chairs. It has an adjacent syndicate room and en-suite cloakroom.